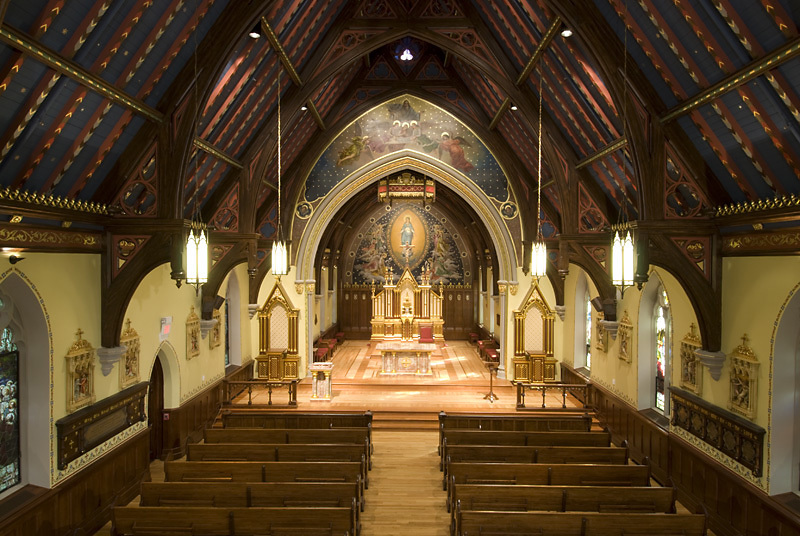 Since its opening in 1863, the Chapel of the Immaculate Conception has been the heart of Seton Hall College and University. It is the sacred place where Mass is daily celebrated. It is a quiet retreat for students in the midst of examinations or simply a trying day. It is the favorite church for weddings of Seton Hall alumni. It is the place to which many alumni bring their children to be baptized. It is the somber setting for funerals and memorial services for students, faculty, and staff, bringing comfort to families and the University community. Designed by Jeremiah O'Rourke, the noted Newark architect who also designed the Seminary Building (now Presidents Hall) and the Library (now Marshall Hall), it was built of local sandstone in the Gothic Revival style of the mid-nineteenth century. In size and design, it is similar to a medieval English village church. The cornerstone was laid by Bishop Bayley on May 21, 1863. The construction was rapid and, on December 19, 1863, Fathers James D'Arcy and Patrick Cody were ordained priests in its sanctuary. The interior decoration was by J. R. Lamb of New York and completed in time for its dedication on February 7, 1870.